Monday 22 July 2013: Sixteen Weeks Old. It seems that Ayla’s best friend and ultimate protector is none other than Houdini (aka The Dog). 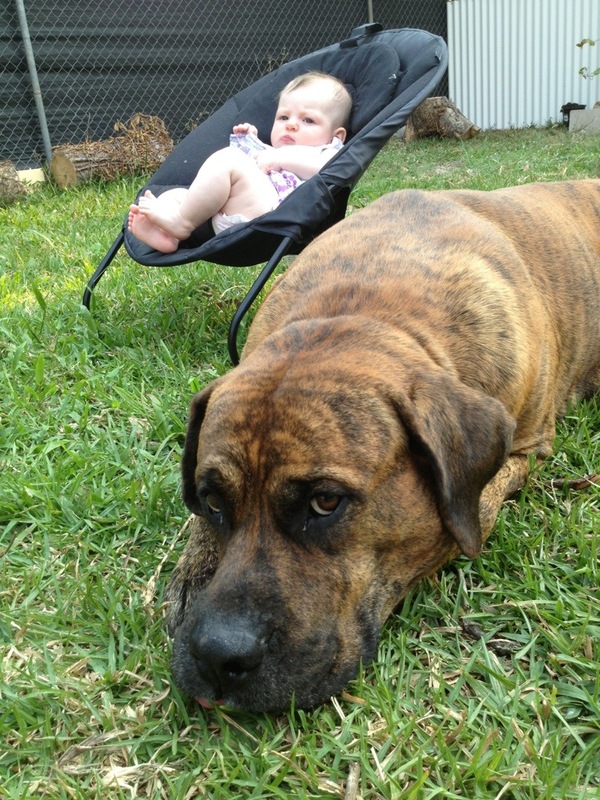 Houdini, a 45kg Boxer / Presa Canario cross, is our original “baby” and he’s been a huge part of our family for the last five years. Houdini was made to love and protect but still, as responsible new parents, Hubby and I have carefully and watchfully introduced Ayla to Houdini over the past few months. Then today I took Ayla outside in her bouncer and placed her on the lawn. Houdini came hurtling around the side of the house, full of beans and boisterous energy and I worried he would knock her over! But as soon as he saw Ayla, Houdini instantly calmed. Without a word or signal from me, he went straight to my baby girl, gave each of her feet and one of her cheeks a quick lick and then lay down beside her. Even where Houdini chose to lie highlighted his understanding that this soft, sweet smelling, tiny human was part of his pack; he had put himself firmly between Ayla and the front gate. While I know this behaviour doesn’t mean the two can be left alone just yet, it certainly shows there’s a friendship like no other in the making. they will become the best of friends El!